I am posting this column in observance of “Throwback Thursday.” I wrote this column for the Herald & Tribune of Jonesborough in July of 2002. It won me a second-place Tennessee Press Association award for “Best Column” the following year. During a recent trip to New York City, mainly for the purpose of visiting friends and seeing the sights, I also availed myself of the opportunity of trying to see a few birds in the Big Apple. A Ring-billed Gull in flight. Several of these gulls were seen during my 2002 trip to New York City. At first glance, New York City doesn’t seem a haven for birds or any other sort of wildlife. Without any serious effort on my part, however, I managed to see 15 different species of birds. My tour guide and friend, David, remained courteous enough to indulge my occasional lapses into birding. David, perhaps like many New Yorkers, is familiar on a daily basis with the Big Apple’s three most prominent members of the bird family — the House Sparrow, the European Starling and the Rock Dove, or pigeon. Everyone who has visited a city park, whether in Jonesborough or New York City, is probably familiar with the Rock Dove. Commonly called pigeon, the Rock Dove is not a native American bird. But their introduction to this continent paralleled the arrival of European colonists. Pigeons came to this country along with other farmyard animals, such as cattle and sheep. But, once here, the Rock Dove, which is a wild bird in Africa and in the Mediterranean, also managed to establish itself outside the farmyard. Nevertheless, more than most other birds, the Rock Dove still only thrives in the company of humans. In New York City, pigeons are a part of the landscape. They are everywhere! As a result, these birds can cause some problems. Their droppings can damage buildings and statues. They can also spread various diseases to humans. Efforts have been made to curb their numbers, but the pigeon looks to be a permanent part of the New York City landscape. It’s no longer a paradise for pigeons in the Big Apple, however. The Peregrine Falcon, once endangered, has rebounded with protection from the government. The skyscrapers of New York City have replaced cliff faces as nesting sites for these sleek, aerodynamic predators. While I wasn’t fortunate enough to see a Peregrine Falcon while in New York City, they are there. Their presence has put some balance back into the food chain. The pigeons now have a natural predator. Earlier this summer, David called me looking for advice about a problem with birds. Seems that a pair of House Sparrows had built a nest beneath his air conditioning unit at his apartment. The problem involved timing. David recently moved to a new apartment and he needed to take the air conditioner with him. In the end, David’s need for the air conditioner outpaced the nesting progress of the sparrows. Now, he’s convinced that the sparrows, like the gulls, are out to get him. More about the gulls later. The House Sparrow is an non-native species introduced to the United States. The House Sparrow was released intentionally in the United States in the 1850s at different points between New York and New England. Other introductions of this species occurred at other points in the United States. The introductions were huge mistakes. By 1910, the House Sparrow had invaded the entire continent. The House Sparrow is also an aggressive bird. Soon, the House Sparrow came into conflict with a beloved American favorite, the Eastern Bluebird. The major competition between Eastern Bluebirds and House Sparrows is for nesting cavities. House Sparrows have the tenacity to evict even the larger Easter Bluebirds from occupied nests. Occasionally, the sparrows even kill nestling or adult bluebirds. I found the House Sparrow almost as numerous as Rock Doves in most areas of New York City. But, there was still a third common bird — the European Starling. I encountered the first starlings of my trip in New York City’s famous Central Park. Ironically, Central Park is where the European Starling, now considered the most numerous bird in North America, got its start. The Rock Dove and House Sparrow got here first, but the European Starling didn’t waste any time once the first starlings were released in 1890. The first European Starlings were released at that time in Central Park because some fans of William Shakespeare wanted to release all the birds mentioned in The Bard’s plays. Apparently, only the release of the European Starling had any lasting consequence. Even today, starlings and Shakespeare are very much associated with Central Park. During the summer there is a popular Shakespeare festival held in Central Park. And, on any summer day, there will always be plenty of starlings in the park. Those were three of the 15 birds I managed to observe on my trip. The remaining 12 species comprised a diverse and at times surprising list. I found American Robins, American Crow, Blue Jay, Chimney Swift, Carolina Wren and Downy Woodpecker within Central Park. In addition, at a large pond within the park I also observed a Green Heron and Mallards. The Robins, in particular, appeared as they would in any park setting. They hopped about on grassy lawns while foraging for food. David told me he recently saw a Roadrunner in the park. I told him that would be an extraordinary discovery since that bird is native to the western United States. There’s a lot of water in and around New York City. Perhaps it isn’t a surprise to discover birds such as Double-crested Cormorants swimming in the East River. I also saw plenty of gulls. 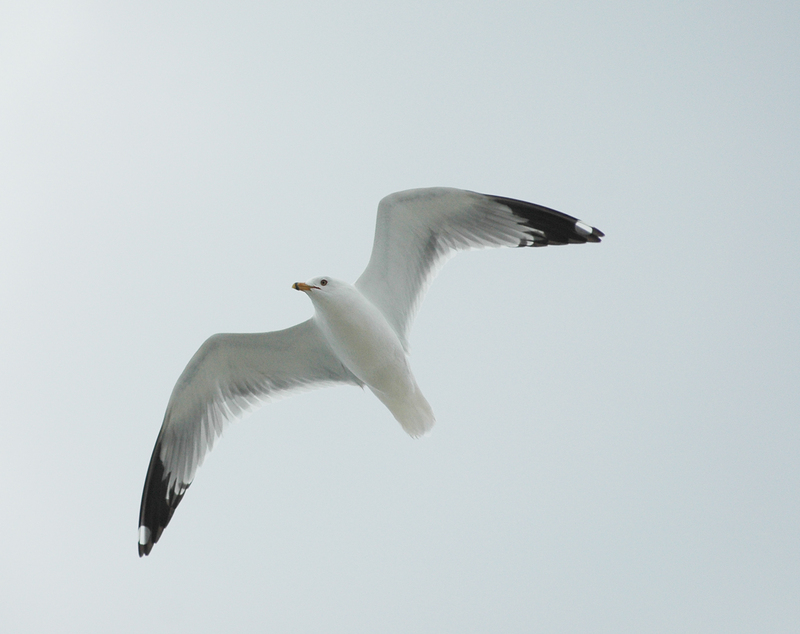 In fact, I saw three different species of gulls — Herring Gulls, Ring-billed Gulls and Laughing Gulls. Surprisingly, gulls haven’t always been common in the vicinity of New York City. 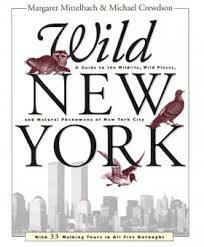 According to the book Wild New York: A Guide to the Wildlife, Wild Places and Natural Phenomena of New York City by Margaret Mittelbach and Michael Crewdon, gulls did not frequent New York City 100 years ago. Now, there are as many as one million gulls in New York City. The book also mentions one of the attractions: Staten Island’s Fresh Kills Landfill, the largest garbage dump in the world. My friend David considers gulls evil omens. I tried to do some research into the role of gulls in folklore. I turned to the book by Laura C. Martin titled The Folklore of Birds. Her entry on gulls proved sketchy. Here’s some of what I learned. The word “gull” comes from a Welsh word, “gwylan,” which can be translated as “wailing.” The term “gull” apparently derived from the bird’s wailing or plaintive call. The Latin genus name, Larus, for gull is translated as “ravenous seabird.” So, that leaves us with a ravenous, wailing seabird. Apt descriptions, but not exactly a rich folklore. Birds such as crows and the various species of owls have much more ominous superstitions surrounding them. New York City has a “New York Rare Bird Alert.” If you would like to know what rare birds are being seen in New York City, dial (212) 979-3070. I dialed the number during my visit and received information about excitement regarding large flocks of migrating shorebirds, a Common Raven and nesting Blue Grosbeaks. My friend David now lives in Baltimore. I haven’t visited him there, but he has visited me in the mountains near Asheville, N.C. I’d like to thank him again for my taste of the Big Apple. I’d still love to hear from readers. Just post your thoughts here or email me at ahoodedwarbler@aol.com. Keep up with me on Facebook, too. This entry was posted in Birding, Birds and tagged Birding Central Park, Birding in New York City, Birding the Big Apple, Elizabethton Star, European Starlings, Feathered Friends, House Sparrows, Our Fine Feathered Friends, Peregrine Falcons, Ring-billed Gulls, Rock Pigeons, Shakespeare's birds, The Erwin Record on February 13, 2014 by Bryan Stevens.